Examples, videos, worksheets, solutions, and activities to help Algebra students learn about dividing polynomials using synthetic division. How to divide polynomials using synthetic division? 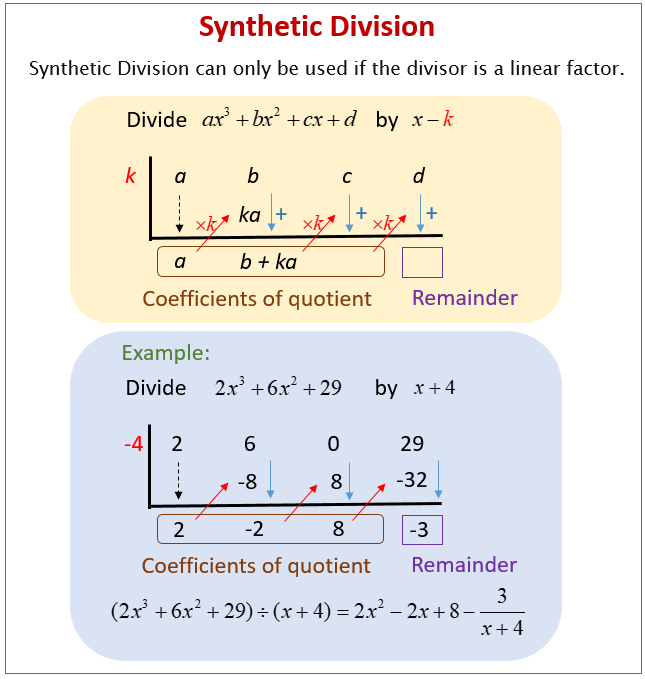 Note that we can only use synthetic division if the divisor (or denominator) is a linear factor. 1. Place coefficients in descending order on the inside. 2, Place the number in the denominator with opposite sign on the outside. The following diagrams show how to divide polynomials using synthetic division. Scroll down the page for more examples and solutions. This video shows how you can use synthetic division to divide a polynomial by a linear expression. It also shows how synthetic division can be used to evaluate polynomials! Another video showing how to use synthetic division to divide a polynomial by a linear expression and also how to use the remainder to evaluate the polynomial. Here is a homework problem involving synthetic division. It is similar to polynomial division using long division but can be a quicker and easier way.